"This is definitely one of the best strains I have ever tried besides Blue Dream. It uplifts you into the happiest, calming mood ever. It also can get you very aroused because all of your senses are intensified. I had multiple "O's" while high on this. It seemed like it lasted for ever. Even music feels like it's pulsating through your body. Very euphoric too... 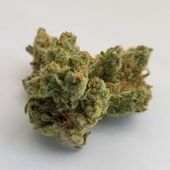 I would recommend this strain for anxiety & depression, ..."
"The nugs were super frosty and dense!!! The aroma of the bugs were sweet, like honey! The strain helped me with nerve pain in my amputated finger, and helped me speak clearly (I've studdered since a kid.)"